In Walla Walla, the sidewalks are rolled up promptly at 8, even on the weekends, and even in the height of the tourist season. As one would imagine, this can be frustrating for the residents of the city, whose dining options are reduced to Shari’s and Wendy’s if it’s later than 9p.m. And often, neither of those seems remotely appetizing, no offense to the hard-working waitstaff at either business. Additionally, sometimes I just want a little piece of sweetness that isn’t in the form of straw-busting milkshake. No offense to the Frosty. We were, in this context, overjoyed at the accessibility of bakeries here in Emerald City. 10 at night on a Saturday? 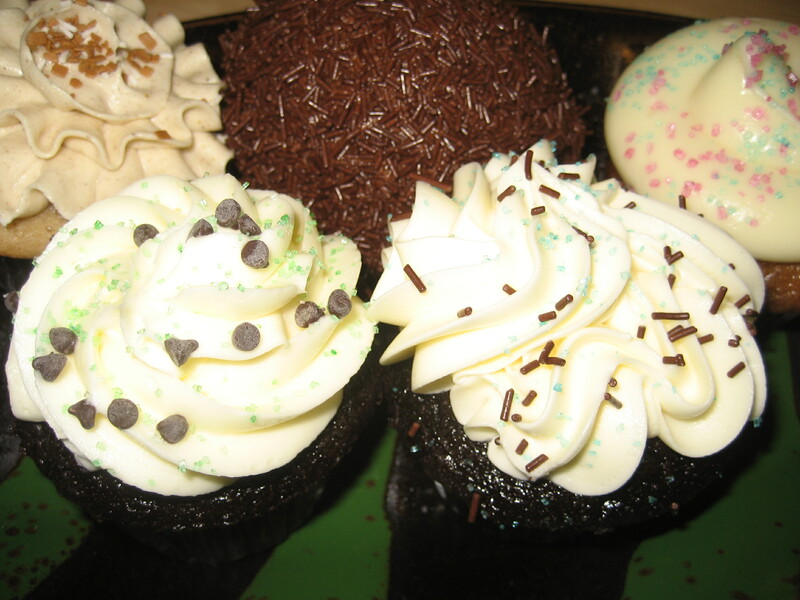 No problem, just drive over I-5 into Capitol Hill and get a couple of cupcakes from Cupcake Royale. Can’t find parking? No problem! I’ll just drive around the block while Susanne makes a purchase—she knows my favorites, of course—and by the time I’ve circled back, she’s got a lovely pink box with some sweet treats inside. Cupcake Royale changes their flavors around on a regular basis, so Susanne has been frustrated that ever since her first encounter with the delectables, she hasn’t been able to get any more salted caramel cupcakes. I can sympathize; it was some pretty intensely good frosting, paired well with a reasonable, if not over-the-top chocolate cake. Nice crumb, great moisture without tasting too oily in one’s mouth, good sweetness to the frosting but no lard-like aftertaste. I have wasted too many minutes of my life being turned off by Cake Love’s awful frostings. Buttercream should not have to “come to temperature” just to taste good, Mr. Brown. Yes, we’ve had this discussion before, he and I. It does seem to me, I who have consumed what probably amounts to a small box truckload of cupcakes in my lifetime, a harder thing to create well than one would at first presume. There is the problem of the cake drying out because it’s composed almost entirely of edges. Frostings can be too cloying, overwhelming more subtle flavors in the cake. They can look ghastly, which puts one off from trying them in the first place. They may be cooked unevenly, or still be somewhat batter-like in their interiors, which would just be this side of disgusting. And for each of these treacherous potential flaws, there are over-corrections. Using too much oil in the batter to retain moisture also gives certain people who shall remain nameless a significant quantity of intestinal distress. Trying to make the frosting pretty enough leads some to using a pastry bag to apply toppings, only to leave a lot of the cake’s top bare and unprotected from drying out. Under-sweetening the frosting can leave eaters with the nasty sensation that they are eating confabulations of flour, baking soda, and dairy product, and that is not the flavor profile anyone needs to experience. I’m all for molecular gastronomy and food deconstruction, but not in my effing cupcakes. Cupcake Royale suffers a smidge—a technical term, I recognize—from the pastry bag effect, or PBE, not getting its frosting out enough to the edges of the cake top. I’m going to venture out on a limb here and say that they’re trying to keep the cupcakes prettier and more protected when moving them out of the display and onto customer’s plates. But if one, say, waits until the next day to eat one’s cupcake, purchased the night before at 10p.m., one will indeed find the outer ring is dry. Maybe acceptable on Saturn, but not here on Earth. Overall, their flavors are in a kind of normal distribution, with the bulk being things that people can relate to easily, like full-on double chocolate, red velvet, yellow cake, all the way to more bourgie flavors, as with the aforementioned salted caramel, a lavender cupcake, and lemon. I’m a fan of lavender, but Susanne eschews it, which I know after making her some lavender sugar cookies one day. I scoured all of DC for edible lavender, and her only comment was that they tasted like soap. No more lavender snacks for her. 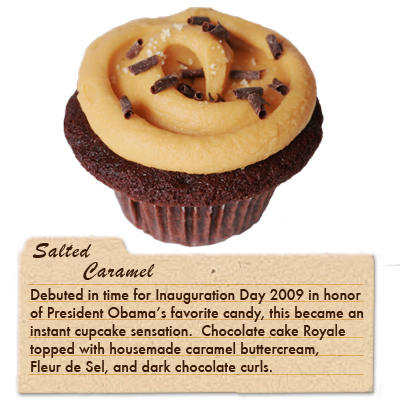 We’ve also heard a lot about Trophy Cupcakes, which like Cupcake Royale, has several locations across Seattle. We stopped in at the Wallingford location, which is in an old school that reminded me a lot of my primary school—hence I was somewhat hesitant to do anything as sinful as eat anything sugary. 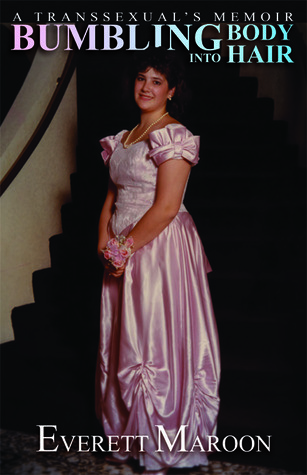 Oh, the damage those Sisters of Mercy did to my young psyche! Trophy has “everyday” flavors and flavors of the day, so we picked up five cupcakes to check out. Trophy has, generally speaking, a more adventurous take on cupcakes than Cupcake Royale, but I’m not going to say that this is better or worse. It’s really more about what each customer wants. There is something to be said for the classic cupcake, and there’s something undeniably fun about experimenting with the cupcake as a form. 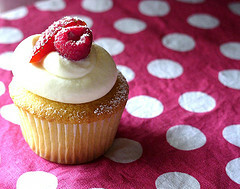 Heck, the “Snowball” cupcake, a Friday-only item, looked almost like a small Muppet. Which would not intimidate me one bit, as it happens. Trophy’s cupcakes were notably oily, especially the non-chocolate cake varieties. This is somewhat understandable, in that it’s hard to keep moisture in a carrot cake without using oil, so the vast majority of carrot cake recipes include oil instead of butter. I get that. But even one cupcake was enough to satisfy all of my lipid needs for the next 72 hours. Tasting the chocolate cupcakes was a different experience. Like Royale, they had a good crumb and structure, and a moderate, if not luxurious, chocolate taste. I would love to see someone go full bore with some extremely dark cocoa, but I bet it’s cost-prohibitive. They were very enjoyable cupcakes, these Trophy products. Who am I to talk? Martha Stewart herself called them “utterly delicious.” I wanted, however, more of a mint kick from the chocolate mint. That was perhaps the only let down. I hear there are more cupcakes to be had in Seattle. I intend to seek them out and try them, after I’ve done a little walking first. Mmmm cupcakes! I love that salted caramel from Cupcake Royale. I also love the triple chocolate from Trophy Cupcakes. Both beat that silly Georgetown Cupcake now featured on that DC Cupcake show. They didn’t sift their flour so I got a couple huge globs of flour pellets and the buttercream was blah. Whether Royale or Trophy, Seattle cupcakes beat DC cupcakes for sure! Why did wordpress give me that angry (and apparently voiceless) icon? Guess they didn’t like hearing the truth about DC cupcakes, but those flour globs don’t lie!